​Produced by: Robert Greer with the cooperation of Theater Resources Unlimited. “Mr. Bengt’s Wife, in its American premiere (translated by Malin Tybåhl and Laurence Carr) treated me to an insightful view of a master in his early development. A no-holes-barred tale of hysteria, gender expectations and personal redemption, it is a mirror opposite of the mature and organized Ibsen’s A Doll’s House. The play is still ground-breaking, one of the true classics of progressive theatre. 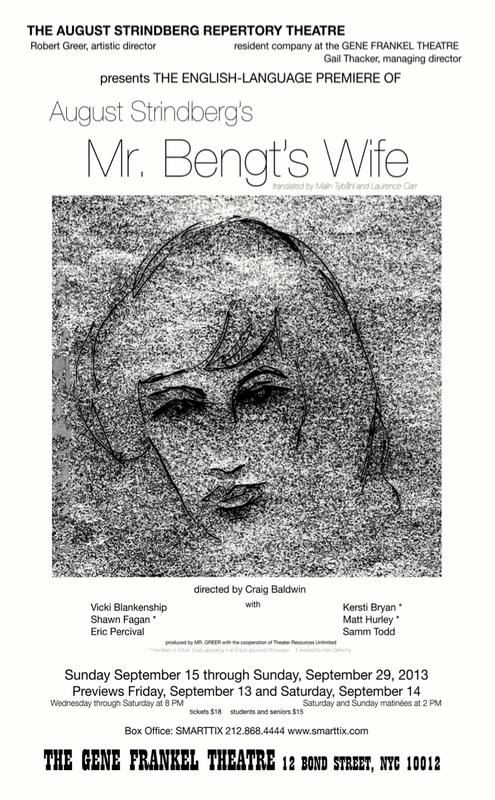 Mr. Bengt’s Wife is a delirious collection of scenes boasting a lyricism approaching madness, with a heightened Shakespearian influence running through its modern language. Bengt is a transitional piece, like one of a great composer finding his voice. And it is a glorious voice he is crafting. The work is deeply emotional—ultimately leading toward a human conclusion. It has a stylized, episodic element to it, almost dream-like. Directed by Craig Baldwin, the piece was allowed to breathe, but always moved forward in its action. Kersti Bryan, well suited to the demanding role of Margit, never missed a beat, transforming herself from the high-flying, overly optimistic girl to the bitter and unforgiving wife and then back again, prompting us to ask if she is dangerously unstable or merely a multifaceted woman." From the “Good Odds” column, Time Out New York, September 26-October 2, 2013.